Take a look at Josée Landry and Michel Beauchamp's gorgeous front yard kitchen garden in Drummondville, Quebec. The cucumbers, tomatoes, zucchinis, beets, onions, and brussels sprouts and other vegetables grown by the couple helped Beauchamp lose 75 pounds, and Landry 25. Boing Boing points us to a petition to save the garden, which authorities insist must be removed. The town code states that a vegetable garden can take up 30 percent of a front yard at most, and Landry and Beauchamp's is in violation. They were given two weeks to comply, which means the garden must be drastically scaled back by this Sunday. Front yard kitchen gardens are not the problem; they're part of the solution to healthier and more sustainable communities. Thanks for helping us to defend them. Beauchamp said no one has complained to him. He said he shares his fresh produce with his neighbours. "They love it. Everybody is surprised by the kind of taste we can have from fresh vegetables," he said. The couple said they have no intention of complying with the city's request. 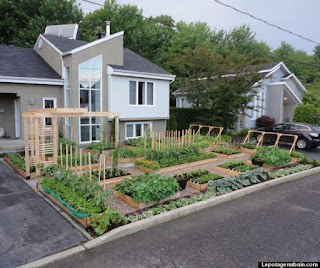 CBC also notes that the city plans to make all front lawn vegetable gardens illegal this fall. The measure would only apply to new gardens, so Landry Beauchamp garden -- assuming they scale it back -- will be perfectly legal. How does the larger gardening community feel about attempts to remove the garden? 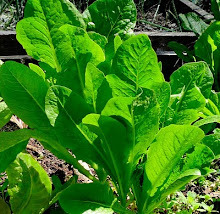 Boing Boing has a quote from kitchen garden advocate and expert Roger Doiron: "If this garden is deemed illegal, we're in deep you-know-what." Learn more about the couple's personal website, Le potager urbain. Fair warning, it's written in French. Language barrier or not, the pictures are pretty cool. Watch the making of the couple's garden in the video below. What's not to like? Whether an unripe tomato has a gene form that leads to uniform light shade (right) or a darker shade on top called shoulders (left) could have consequences for the fruit's final flavor. Courtesy of Hakan Aktas It looks like 70 years of breeding for better color in unripe fruit has inadvertently helped create the wet-paper towel flavor of the modern tomato. Growers care about the green of unripe tomatoes, explains biochemist Ann L. Thomas Powell of the University of California, Davis. Ripening globes that are each uniformly green let growers easily judge when a field will be ready for harvest. Over decades breeders have selected for this uniform green coloring instead of for tomatoes that turn a deeper shade around the stem end, Powell says. The problem is, getting rid of that dark green zone, called green shoulders, turns out to have sabotaged a gene called SlGLK2 that boosts sugar and other sources of flavor in the ripe tomato, Powell and her colleagues report in the June 29 Science. “It is a good illustration of unintended consequences,” says molecular biologist Harry Klee of the University of Florida in Gainesville, who studies tomato flavor. For years, Powell says, breeders assumed that a ripe red tomato got all of its sugars from the little photosynthetic engines known as chloroplasts in the plant leaves. It turns out, however, that a green-shouldered tomato gets about 20 percent of its sugars from its own chloroplasts. Without a functional SlGLK2 gene, the ripening tomato forms fewer and punier chloroplasts that don’t deliver, Powell and her colleagues have found. Skimping on sugars certainly could make a difference in flavor, says Klee, who routinely does taste tests in his lab. His tomato testing panels respond strongly to sugar content. “The more the better,” he says. Volatile compounds wafting off a tomato’s flesh also play a big role in its appeal. The problem is, inadequate chloroplasts likewise won’t produce as much of the chemical precursors for some of those compounds. “It’s totally obvious you’re going to take a hit in some of the volatiles,” Klee says. In the June 5 Current Biology, he and his colleagues highlighted the importance of a handful of volatiles — some of them mere whiffs — in seducing the nose and taste buds. Picking them before they’re fully ripe diminishes flavor, as does refrigerating them. Chilling tomatoes below 13º Celsius kills metabolic processes still functioning in a picked tomato, Klee says, so the fruit never manages to replace the lovely volatiles that float away. Even under ideal conditions, genetic differences will matter in flavor. When Klee and his colleagues pamper various commercial varieties, taste panels pan some of them and give the best ones decent but not brilliant ratings. And just because a variety is an heirloom doesn’t mean it tastes great, he cautions. For his taste panels, Cherry Roma is the reigning favorite. When choosing among generic tomatoes, he recommends going for cherry tomatoes and other little types: “Breeders haven’t had as much time to mess them up,” he says. An easy-to-build backyard rain garden is a work of art that will help you solve your drainage and runoff issues. Whether your backyard is large or small, rain gardens enhance the landscape while improving runoff problems and the ecosystem. Tired of that muddy puddle in the middle of the yard, or that washed-out mini-gulley that forms whenever a downpour loads up your home’s downspouts? If so, it might be time to get a handle on all that runoff and put it to good use by learning how to build a rain garden. These shallow saucer-shaped gardens, commonly described as “nature’s water filters,” are designed to capture excess runoff that can potentially wreak havoc on your soil and pollute waterways. All you need to create your own rain garden is a well-designed plan, a handful of native plants, and some good old-fashioned elbow grease. Rain gardens are designed to catch storm runoff from rooftops, patios, sidewalks, roads and other impervious surfaces. During a storm, rain gardens will fill with a few inches of water that gradually filter into the ground. When properly designed and constructed, these structures can hold water for around 24 hours and will not attract mosquitoes — they’re much more likely to attract birds and beneficial insects. Rain gardens can be helpful wherever water runoff is an issue. Ideally, you will want to situate the rain garden in between the source of the runoff and the runoff destination. Before you break ground, make sure the garden is at least 10 feet from any buildings or structures, and at least 25 feet from any septic system drain field. Also be sure to avoid underground utility lines (call 8-1-1 at least 48 hours before digging), and if you have trees on your property, avoid disturbing established root systems. Sandy and loamy soils work best for these backyard havens since they tend to drain well. Clay soils can become waterlogged and may not be suitable for a rain garden. Test the drainage of potential sites by digging a percolation test hole that is at least 8 inches wide and 8 inches deep. Fill the hole with water and let stand. Ideally, the water should drain at a rate of about an inch every hour. If you are working with hard clay soil that won’t drain, remove it and replace it with a mix of approximately 60 percent sand, 20 percent topsoil and 20 percent compost. A rain garden can be almost any size, but most residential rain gardens range from 100 to 300 square feet. Many are the shape of a saucer or kidney bean, with the largest side facing the source of runoff. Use site conditions as a natural guide in shaping the garden. Rain gardens are generally 4 to 8 inches deep. Anything deeper than 8 inches may pond water, and rain gardens less than 4 inches deep may not provide enough water storage for proper infiltration. The slope of the land should help determine the depth of the garden. Use the following general guidelines to determine rain garden depth. If the slope is less than 4 percent (4 feet vertical in 100 feet horizontal), build the garden 3 to 5 inches deep. If the slope is between 5 percent and 7 percent, build a garden 6 to 7 inches deep. If you are working with a slope in the 8- to 12-percent range, make the garden about 8 inches deep. Remember, rain gardens are easier to install and tend to work best in places where the ground is relatively level. To determine the length and width of the rain garden, think about how it will catch runoff. Runoff should spread evenly across the rain garden so water doesn’t pool at one end or spill over before it has a chance to filter into the ground. 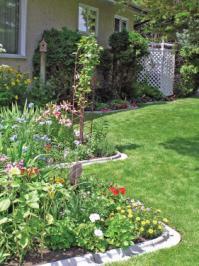 Plan the garden so that the longer side faces upslope. This will ensure that the garden catches as much runoff as possible, and that the water spreads across the entire length of the garden. The width of the rain garden will depend on the slope of the land, but most residential versions are between 10 and 15 feet wide. Remember, if a rain garden is too wide, it may become necessary to add additional soil to the downhill half of the garden. Here is a relatively simple formula to approximate measurements for your rain garden. First, find out which hard surfaces will be producing the storm runoff for your garden. Let’s say you are planning to use roof runoff as the main source of water. In this example, you would measure only the parts of the roof that will be “feeding” the garden. Measure the width and length (in feet) of that part of the roof, then multiply the two numbers to get the square footage. This number is your “drain area.” If you are gardening with sandy or loamy soil, plan on making your rain garden about 20 percent to 30 percent of the drain area size. For instance, if the part of the roof that will provide runoff to the garden measures 1,000 square feet, you’ll want to make the rain garden 20 percent to 30 percent of that number, or 200 to 300 square feet in size. If you are working with clay soils, plan on making the rain garden larger to compensate for poor drainage. Start by defining the borders of the rain garden by laying a string or hose around the perimeter or marking it with fluorescent spray paint. You can use a rototiller or backhoe, or dig by hand, depending on the size and depth of your garden. As you dig to the desired depth, heap the soil around the downhill edges to create a berm. Once the soil excavation is complete, use a hand level to make sure the bottom of the garden floor is level. Mix and add necessary soil amendments. Again, if you are working with clay soil, create a simple garden soil mix of sand, topsoil and compost to amend or replace the difficult soil. Once the soil has been amended, let it settle overnight before planting. Choose native plants appropriate for the sunlight exposure and soil conditions of your rain garden. Plants need to tolerate standing water for up to 48 hours, as well as some periods of drought. First-time rain gardeners are encouraged to contact their local soil and water conservation district for a list of native plants that work well under local conditions. Keep identification tags on the plants — or otherwise label them. Some plants may thrive better than others, and this can help you start to identify plants that work best in your garden. Now it’s time to plant. As a general rule, plant shrubs 3 feet apart, perennials 1 foot apart, and annuals 6 to 8 inches apart. Apply 3 inches of mulch, and water plants immediately after installation. Most rain gardens do not require much maintenance. Check plants periodically for signs of wilting, and weed as necessary. Also, check for berm failure and ponding. If standing water occurs longer than two days, this is a sign that the garden is not draining properly. A rain garden offers an opportunity to use your imagination, so be creative as you design a beautiful oasis on your property. A writer and gardener living in Phoenix, Patricia Escarcega is always looking for and experimenting with new ways to conserve water while keeping a garden in the desert. Organic Tomatoes ARE More Nutritious! The debate about whether organic food has more nutrients might be finally settled, at least in the case of tomatoes. The latest research from the University of Barcelona shows that organic tomatoes have higher levels of antioxidants than chemically-grown ones. The research team studied and analysed the chemical structure of the Daniela variety of tomato. According to The Daily Mail: "They detected 34 different beneficial compounds in both the organic and conventional versions”� However they found that overall the organic tomatoes contained higher level of the polyphenols. The scientists says this difference between organic and conventional tomatoes can be explained by the manure used to grown them." This makes sense because plants produce polyphenols to fight off diseases, and when we ingest them, we get the same disease prevention benefits. In a chemically-intensive agricultural system however, the plants’ natural ability to defend itself is diminished as that work is taken on by pesticides and fungicides. Polyphenols are a class of natural antioxidants and they halt the development of certain cancers as well as some chronic conditions due to their anti-inflammatory properties. There is a class of polyphenols called flavonols which impart flavour and taste to fruits or vegetables. That's the reason why organically grown food is said to taste better, although this is debatable. However the scientific findings that organic tomatoes have more polyphenols than conventionally grown ones is more proof that chemical agriculture does not impart any nutritional value to food. Although this has been proven before in 2004 in a study by UC Davis, and more recently by the University of Newscastle, the nutritional superiority of organic food still is a subject for intense research. In spite of the results of the research, organic food still has not gained widespread acceptance. It is still more expensive than chemically grown food and the market for organic food still remains stagnant. In many countries, organic food is not even widely available. All of this needs to change before people are able to benefit from the nutritionally benefits of organic food.